National Training Center and Fort Irwin Commander Brig. Gen. Joseph Martin, Pvt. Nathan Sotelo and Sgt. 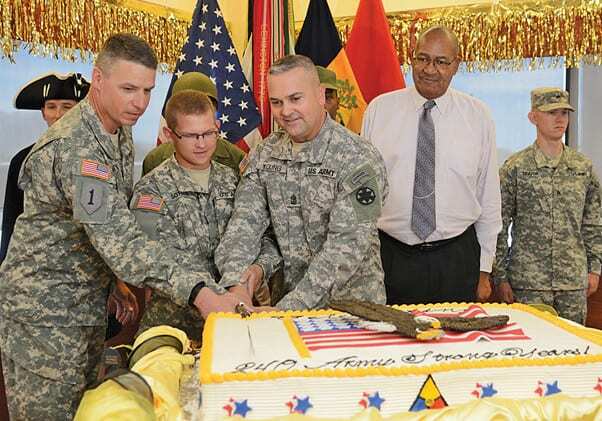 Maj. Stephen Young cut a cake during the 240th Army birthday celebration here, June 15. Sotelo represented the youngest Soldier here at 17; he serves with F Troop, 2nd Squadron, 11th Armored Cavalry Regiment. 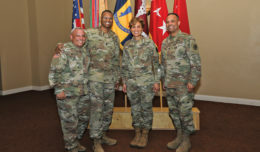 Young is the NTC G3 sergeant major and represented NTC interim Command Sgt. 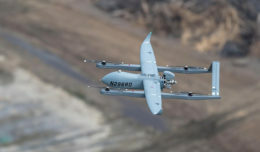 Maj. Noe Salinas. 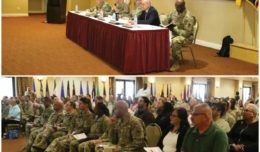 National Training Center and Fort Irwin Soldiers, leadership and the community paid homage to the Army’s 240th birthday at a celebration here, June 15. The NTC and Fort Irwin Commander Brig. Gen. Joseph Martin addressed an audience gathered at dining facility 1 prior to the cutting of a cake and a special meal. Martin described the celebration as one of many things that sets the United States Army apart from just about any other organization. The general explained that values and ethics are fundamental to the Army. Martin performed the cake cutting tradition with Pvt. Nathan Sotelo and Sgt. Maj. Stephen Young, who is the NTC G3 sergeant major. Sotelo is the youngest Soldier at 17 here. His branch is infantry and serves with F Troop, 2nd Squadron, 11th Armored Cavalry Regiment. Sotelo, a Kansas City native, arrived here to his first duty station, May 25. He said it was an honor to have been recognized and have participated in the ceremony.